2 Fords, 2 Audis, 2 drivers, 2 days. 2 weeks ago the Audi 5000 and 200 both left my care. The short version goes as follows. A gentlemen contacted me after having the cars for sale and decided to buy them from me for an extremely reasonable price. 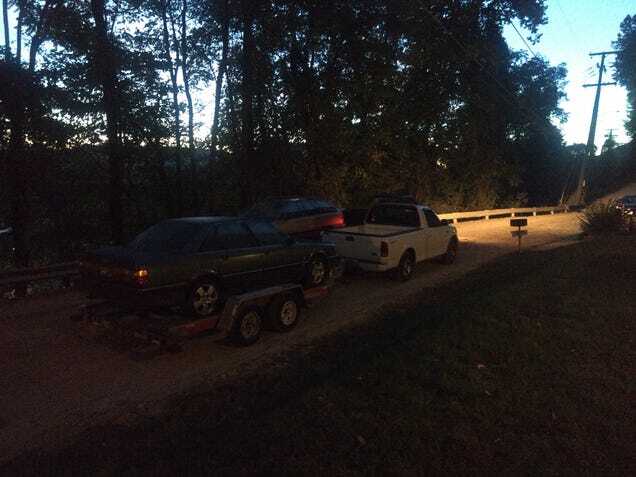 After 6 months of title issues finally solved and an unfortunate vandalism, I and a friend trailered both cars 450 miles from basically Charleston WV to basically Atlanta GA.
After about 12 hours of driving and setbacks and about $300 in fuel between 2 trucks, we finally made it about 8pm. We dropped off the cars and since then the new owner has kept me posted on the project he has been persuing with my cars. Took windows from the blue car to fix the wagon! Hats off to you Mr Krauss. Godspeed. Audi 5000 part 6? Maybe?